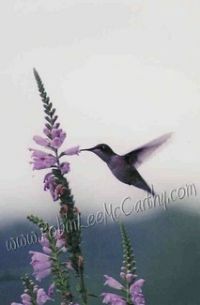 © Photograph by RLM of a Beautiful Hummingbird Sipping Nectar From an Obedient Flower. You will LOVE this picture! Have sold 1000'S of these! So as you can see it is popular! Greeting card will come in either all white or with a pink edge. Customers say it is my best photograph! Greeting card is blank inside so that it may be used for all occasions and will brighten up a friend's day. One Stamp required for First-Class U.S. Mail.